Robert Bender of Friends of Wilson Reserve (1 km downstream and on the opposite bank to Burke Rd. 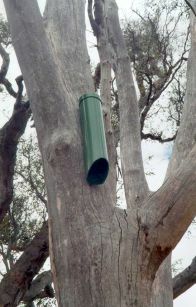 Billabong) has erected bat boxes and has a thriving colony of microbats - mainly Gould's Wattled bat Chalinolobus gouldii. I thought it would be good to provide more habitat upstream, and the site assessment says, "This site would be one of the most promising in Boroondara for any survey of reptiles or bats." And why survey if the bats will come to you? Keith and Leanne Oberin, Land for Wildlifers from Barnadown, own a large property on the banks of the Campaspe River which combines agricultural as well as conservation activities. 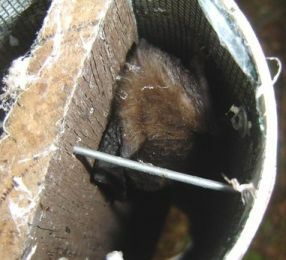 Keith decided to supply nest boxes for the various wildlife found in the area, including bats. For his bat nest box, he modified a plan he found in `The Nestbox Book' produced by the Gould League. 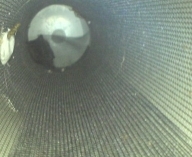 As you can see in the photo it is actually a 'bat tube' made out of 6 inch PVC pipe with the opening at the bottom, cut on a 45 degrees angle. The top of the pipe had a PVC end. Keith lined the inside with shade cloth which he attached using pop rivets. He also pop riveted on a galvanized tin strip at the back of the top which he used to attach to the tree. Wiring on the tube could have led to the tree being ring-barked. He then painted the tube a khaki green to blend in with the bush. Keith kept checking the bat tube with a torch and within a month, bats had moved in. With an open end, there was no worries about bat scats collecting and accumulating and it allowed easy monitoring (including for bee and wasp infestation). I wrote to Keith to find out how they were six years later. He reported that the tubes were still in excellent condition and he expected they would last indefinitely. So, off to the hardware store. I built 10 for the Billabong. I have used fibreglass flywire instead of the shade cloth. One detail that the "Gould League nest box book" and the "Land for Wildlife" newsletter omit is that the length should be about 600mm. I ran the prototype (pictured left) by Ian Temby (DSE Wildlife guru) and he suggested a 145mm wide x 450 - 500mm long piece of timber in the 150mm tubes to create 2 microclimates within the tube. I have also tried the timber divider in the 90 mm tubes. 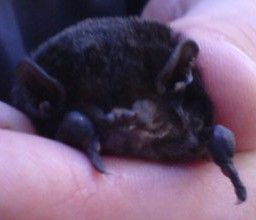 The microbat stayed in the same tube until late July when it shifted tubes. Pictured here at the top of the new tube and out of the tube. It is a male Gould's Wattled bat (Chalinolobus gouldii) and in torpor. 29 April 2011 - A check of the bat tubes showed 2 tubes in use with several in one. The bat survey group from Wilson Reserve collected and 'assessed' the bats. There were 3 females and 1 male in each tube. They were released at BRB after dark. 22 February 2014 - 31 bats in tube 8 - including a broad-nosed bat (Scotorepens orion) (pictured), and 1 in tube 10. The most bats to date and the first species other than Gould's Wattle bat (Chalinolobus gouldii). 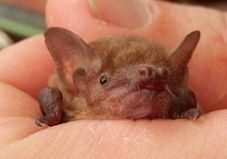 Info about Melbourne's bat box projects with reports, dates of forthcoming events, etc. Some details for Burke Rd. reserve are included with Wilson Rreserve.